Hey, Friends here is a good opportunity to start your career in the central government sector! The CSIR-Central Road Research Institute (CSIR-CRRI) has invited the candidates to apply for the recruitment 2019. 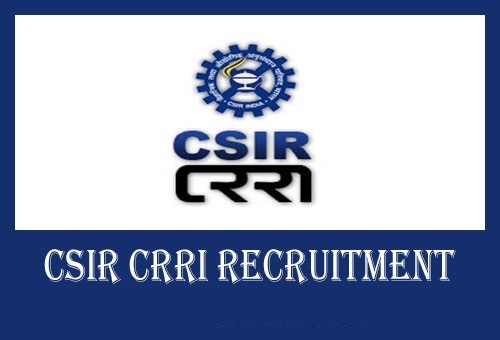 The main motto of CSIR-CRRI recruitment 2019 is to fill the 41 vacancies in various posts such as Technician and Technical Assistants. CSIR-CRRI is looking for the skilled and eligible candidates to carry out the roles and responsibilities of the respective posts. Both freshers and experienced candidates can apply for the CSIR-Central Road Research Institute Recruitment 2019. The applicants can send the application via online or offline. However, you need to pay the application fees through online only. The selected candidates will be placed at Delhi and the pay scale varies in accordance with the posts. So, grab the chance and shine in your career life! Technicians: The candidates who are all applying for the CRRI Technician Recruitment 2019 must have completed SSC 10th or equivalent from the recognized board or institute. You should possess at least 55% score in the science subject and ITI certificate in Electronics/ Instrumentation/Mechanical/Electrical/Computer/Library and Information Science Trade specialization. The applicants who have two years of full-time experience as an apprentice trainee from the authorized institution are eligible to apply. Technical Assistant: The candidates who are all applying for the CRRI Technician Assistant Recruitment 2019 must have the 1st class diploma in Electronics Engineering or Technology with full-time duration. Otherwise, the applicants with at least 2 years full duration diploma course or its equivalent with 2 years experience are eligible. Note: The application fee is non-refundable which must be deposited online. You should take the photocopy of the Challan to include in the application form. The candidates who are applying for the CSIR-CRRI have to make the payment via online. The candidates applying for the Technician and Technical Assistant post should not be over 28 years as on April 16, 2019. The age relaxation for these posts is up to 33 years for SC/ ST candidates and 31 years for OBC candidates. Step 2: Click ‘News’ option in the advertisement “Applications are invited for the post of Technician and Technical Assistant”. Step 7: Send the printed application form to the given address within the submission date. Step 8: You have to include the hard copy of the application form, fee receipt, passport size photography with own signature and self-attested copies of the required documents. Address: Controller of Administration, CSIR-Central Road of Research Institute, Delhi-Mathura Road, PO CRRI, New Delhi-110 025.